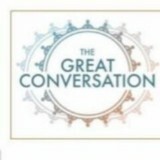 The Great Conversation facilitates safe, respectful and informed community dialogue,recognizing diverse perspectives and encouraging collaborative action. TheGreatConversation hasn’t been active on Medium yet. Check back later to see their stories, claps, and highlights.